Junior Stanislas scored a 98th-minute equaliser as Bournemouth twice came from behind to earn a point in an astonishing game at Vitality Stadium. Everton looked set for victory when goals from Ramiro Funes Mori and Romelu Lukaku put them 2-0 up at half-time. Adam Smith rifled in a sizzling strike from 25 yards and Stanislas converted Joshua King's cut-back to make it 2-2. 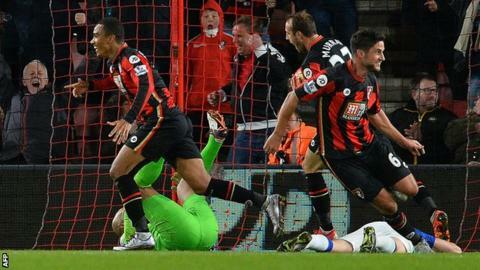 Ross Barkley swept a shot in on the turn in the 95th minute but Bournemouth responded through Stanislas's header. Only five minutes of added time had been signalled, but in truth few could begrudge Bournemouth their last-gasp equaliser after a hugely spirited second-half display. They remain in the relegation zone but move up one place to 18th, while Everton remain seventh after twice squandering winning positions. Everton boss Roberto Martinez will be disappointed but there was plenty to admire once again from his enterprising young team, particularly in an impressive first-half display. The Toffees had already racked up five corners by the 25th minute when they eventually scored their first set-piece goal of the season, Funes Mori rising highest to plant a firm header into the top corner. Gerard Deulofeu was a constant menace down the right flank and it was his superb teasing cross that set up the second goal as he provided an assist for Lukaku for the fifth time this season. The Belgian took one touch across Steve Cook and blasted the ball past Adam Federici to register his fifth goal in four matches. Facing a fifth defeat in six matches, Bournemouth boss Eddie Howe wasn't afraid to take action at half-time - replacing Cook with Smith, and shifting Simon Francis from right-back to central defence. The substitute was at the heart of the hosts' best attacking moves and it was he who reduced the arrears with a stunning goal. When a corner was cleared to him 25 yards out, he took two touches and unleashed a stunning strike which dipped in and kissed the inside of the post on its way into the top left corner. With three minutes of normal time remaining, Bournemouth drew level. A free quick was taken quickly to King, who beat Brendon Galloway down the right and centred for Stanislas to fire in. By now, Bournemouth were exerting all the pressure, but it seemed that they would be denied a point by familiar defensive failings in the most heartbreaking fashion. Seamus Coleman drove into the area and the ball fell kindly for Barkley, who netted his third goal in two games with a shot on the turn. Everton looked assured of victory, but Bournemouth were not to be denied their first come-from-behind point of the season. Charlie Daniels clipped in a cross from the left and Stanislas buried a nerveless header past Tim Howard. Bournemouth manager Eddie Howe: "It's unbelievable how football can play with your emotions. To score in the manner we did at the end was one of the biggest highs I've had in football. An incredible day, though this game is no good for your health. I'll be having an early night tonight. "The character we showed today was excellent. We've shown our resolve and our willingness to improve, which we will need if we are going to get through this tough season. We are improving week on week. We have to now build on today's result." Everton manager Roberto Martinez: "Our first-half performance was very good. We were in control, dominant and scored two goals. But in the second half we lost control, though you must expect the home side to come at you. "We lacked that instinct to put the game to bed. With a two-goal lead you feel very comfortable. After the equaliser we showed good character to score a third. But it was a massive, massive blow to concede so late in the game, and it's a feeling of dropping two points. "I don't know why the referee allowed play to continue for so long, but maybe it was luck for Bournemouth which they haven't had all season." The final two goals were timed at 94:45 and 97:13 - the two latest goals in the Premier League this season. Romelu Lukaku has already matched his tally of 10 Premier League goals from last season. Ross Barkley has been directly involved in more Premier League goals than any other English midfielder this season (11, six goals and five assists). Bournemouth and Everton have now met four times. This was their first league meeting - and the first time the Cherries have avoided defeat. Bournemouth visit Chelsea next Saturday, while Everton host Crystal Palace on Monday, 7 December. Match ends, Bournemouth 3, Everton 3. Second Half ends, Bournemouth 3, Everton 3. Charlie Daniels (Bournemouth) is shown the yellow card for excessive celebration. Goal! Bournemouth 3, Everton 3. Junior Stanislas (Bournemouth) header from the centre of the box to the high centre of the goal. Assisted by Charlie Daniels with a cross. Substitution, Everton. Darron Gibson replaces Arouna Koné. Goal! Bournemouth 2, Everton 3. Ross Barkley (Everton) right footed shot from the right side of the box to the centre of the goal. Assisted by Seamus Coleman. Corner, Bournemouth. Conceded by Ramiro Funes Mori. Attempt missed. Charlie Daniels (Bournemouth) header from the centre of the box is just a bit too high. Assisted by Glenn Murray following a corner. Attempt missed. Glenn Murray (Bournemouth) header from the centre of the box misses to the right. Assisted by Matt Ritchie with a cross following a corner. Foul by Brendan Galloway (Everton). Goal! Bournemouth 2, Everton 2. Junior Stanislas (Bournemouth) right footed shot from the centre of the box to the top right corner. Assisted by Joshua King. Substitution, Everton. Aaron Lennon replaces Gerard Deulofeu. Attempt missed. Charlie Daniels (Bournemouth) left footed shot from the left side of the box is close, but misses to the left. Goal! Bournemouth 1, Everton 2. Adam Smith (Bournemouth) right footed shot from outside the box to the top left corner following a corner. Substitution, Bournemouth. Glenn Murray replaces Harry Arter because of an injury. Attempt blocked. Junior Stanislas (Bournemouth) right footed shot from outside the box is blocked. Assisted by Harry Arter. Attempt saved. Matt Ritchie (Bournemouth) left footed shot from the centre of the box is saved in the centre of the goal. Assisted by Charlie Daniels with a cross. Substitution, Everton. Tom Cleverley replaces James McCarthy because of an injury. Attempt blocked. Arouna Koné (Everton) right footed shot from outside the box is blocked. Assisted by Gerard Deulofeu. Attempt blocked. Andrew Surman (Bournemouth) left footed shot from the left side of the box is blocked. Assisted by Charlie Daniels. Corner, Bournemouth. Conceded by John Stones. Corner, Bournemouth. Conceded by Brendan Galloway. Corner, Bournemouth. Conceded by Gareth Barry. Attempt blocked. Junior Stanislas (Bournemouth) right footed shot from the left side of the box is blocked. Assisted by Harry Arter.